Pick up from our office. Transfer to bus station. Overnight bus to Ephesus(takes nearly 10 hours). Ephesus Ancient City, an outstanding example of a Roman port city, with sea channel and harbour basin. It was Hellenic Greece capital city and was the capital of the Roman Empire’s province of Asia. Ephesus was economically, geographically, politically and culturally significant. Many famous classical philosophers who are still read today such as Heraclitus, lived in the scientific, cultural and artistic city of Ephesus. After enter through the Magnesia Gate and begin a slow downhill walk with your guide . Your route takes you to the Odeon(Concert Hall), The Baths of Varius(used as a Gymnasium), Prytaneion(administrative offices also where religious ceremonies, official receptions and banquets were held), Agora(commercial market of Ephesus), The Temple of Hadrian(dedicated to Emperor Hadrian, Artemis and the people of Ephesus), The Fountain of Trajan(constructed for the honor of Emperor Trajan) and the Great Theatre. The theatre had seating for 24.000 which was the site where it is believed St. Paul preached to the Ephesians and is used today for a local spring festival. 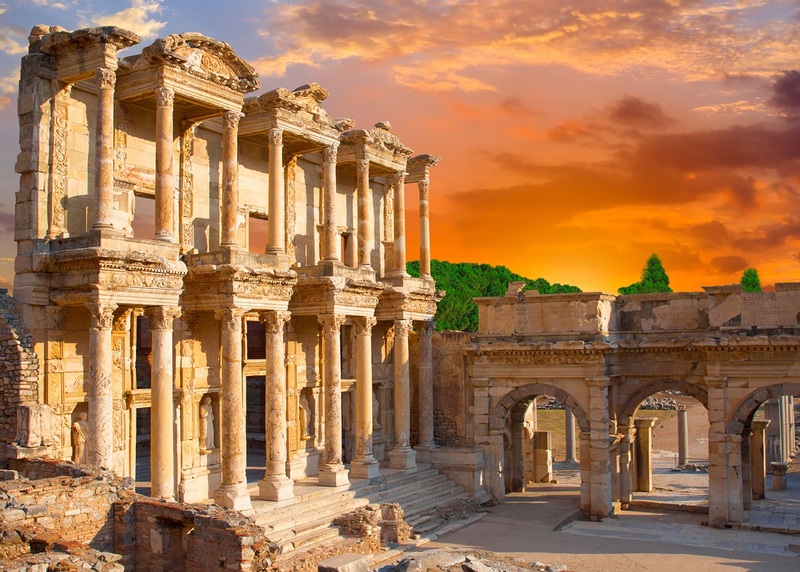 Celsus Library, the most distinctive building and one of the most photographed structure that is commonly associated with Ephesus. It was erected by Gaius Julius Aquila(son of Tiberius Julius Celsus Polemaeanus). Assumed that the constrcution was completed in 117 A.D. It is made of very good marble and decorated with figures of Eros, Nike, rosettes and garlands in relief. Hose of Virgin Mary, is close to the peak of Bülbül Mountain, one of the hills overlooking Selçuk. After the death of Jesus Christ, Virgin Mary had gone to Ephesus with Saint John and lived here since then on until her death at the age of 101.Thus this church is an important pilgrimage center for Christians. There is also a spring believed to be healing. The Popes Paul VI and Jean Paul II visited this house. The House of Virgin Mary is declared to be sacred and an important pilgrimage spot visited by Christians from all over the world. The Temple of Artemis, was in its day the largest in the world, eclipsing even the Parthenon at Athens, and thus earning a spot on the list of the Seven Wonders of the Ancient World. Only one of its original 127 columns remains, often as not topped by a stork’s nest; a poignant testament to the transitory nature of human achievement. Still it is a lovely tranquil place, the enormous pillar giving you some indication of the vast size of temple. Isa Bey Mosque, with the order of Aydinogullari Emirate Isa Bey, was built in 1375. It is a nice sample of Seljuk Turkish architecture. It is on the western side of Ayasuluk Hill on which stand the fortress and the church of Saint John. End of tour transfer to bus station to take bus to another destination or transfer to Hotel.